Most politicians need a lesson in courage, they must stop kowtowing to political leadership and follow their hearts. Most get involved in the political process for the right reasons. Most want change that will benefit their constituents. The problems start when they get to Washington D.C. and the party leaders prey on their weakness. They begin horse trading their votes for the "good of the party," sacrificing their integrity and ultimately their courage. It is a slick process that virtually all politicians get caught up in. If they don't play by the rules they are frozen out of important decision, committee memberships and ultimately funding for their reelection. Courage, perseverance and determination got them to Washington and and they must maintain those virtues if they are going to be judged as exceptional. The Tea Party exhibited courage when they threatened the status quo and challenged the republican leadership. The Tea Party was attacked by republicans, they were undermined at every turn not by democrats but by those that claimed to have the same values. Just imagine a small group infiltrating the party saying that we must stop the out of control spending. Their own party felt threatened and the democrats and the media were all to willing to pile on, calling them extreme, radicals and even Nazis. When in fact the Tea Party were mostly older Americans that wanted spending curtailed. Political leaders simply said to the Tea Party, not only will you not get a seat at the table but we are putting you on the menu! Courage is something that everybody wants — an attribute of good character that makes us worthy of respect. From the Bible to fairy tales; ancient myths to Hollywood movies,our culture is rich with exemplary tales of bravery and self-sacrifice for the greater good. From the cowardly lion in The Wizard of Oz who finds the courage to face the witch, to David battling Goliath in the Bible, to Star Wars and Harry Potter, children are raised on a diet of heroic and inspirational tales. 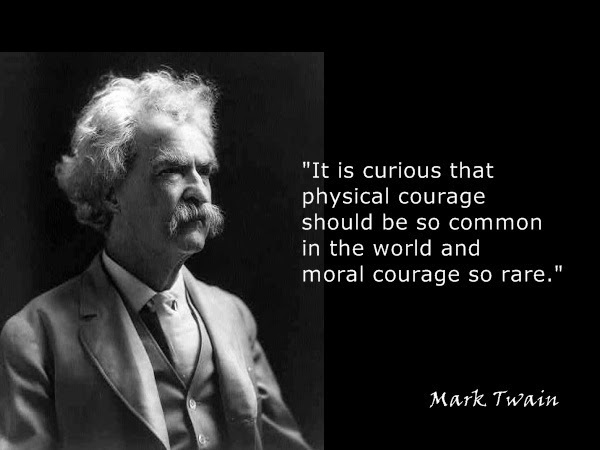 Yet courage is not just physical bravery. History books tell colorful tales of social activists, such as Martin Luther King and Nelson Mandela, who chose to speak out against injustice at great personal risk. Entrepreneurs such as Steve Jobs and Walt Disney, who took financial risks to follow theirdreams and innovate are like modern-day knights, exemplifying the rewards and public accolades that courage can bring. There are different types of courage, ranging from physical strength and endurance to mental stamina and innovation. The below quotes demonstrate six different ways in which we define courage.Which are most relevant to you? In the last section, i present an exercise to help you define and harness your own courage. “It takes courage ... to endure the sharp pains of self discovery rather than choose to take the dull pain of unconsciousness that would last the rest of our lives.” ― Marianne Williamson, "Return to Love: Reflections on the Principles of 'A Course in Miracles'"